Everyone who walks down a city street has seen them, blobs of bubblegum spit out on the sidewalk. Itâ€™s not a very distinguished end to a tasty piece of chewing gum. Well, someone has invented a fine solution to littered gum blobs. 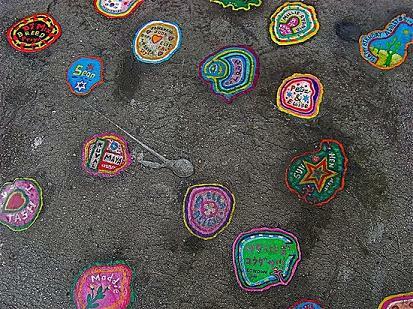 There is a gentleman in England by the name of Ben Wilson who turns these gum blobs into works of art. According to The New York Times, Ben was tired of all the litter in the city so he decided to take matters into his own hands. In order to turn these blobs into works of art, Ben will first soften the gum blob with a small blowtorch and then he sprays it with a lacquer and some coats of enamel. After that, he paints! He uses tiny paint brushes and then seals the painting with a lacquer to preserve it. 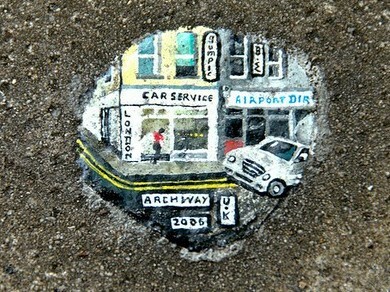 He has painted â€œthousandsâ€ of these gum masterpieces all over London. So, instead of looking at flattened gray blobs of ABC gum (already been chewed), you get to admire tiny works of art. Another great way to recycle, even if it is recycled, used gum.